November sales of the 2014 American Silver Eagle bullion coins ended at a strong level. 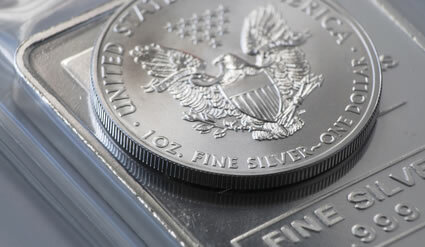 Strong demand has followed a floundering silver market in which prices have hit multi-year lows. Bullion 2014 Silver Eagles hurdled 41.5 million and are on a record annual pace. Year-to date finds gold off 1.8%, palladium up 13.0% and platinum down 11.2%. Bullion Silver Eagle sales reached 3,426,000 in November. While it’s nowhere near record territory, it’s surprisingly high since sales of the coin were temporarily suspended by the United States Mint for 11 days. The tally places November at the 22 spot for monthly sales since the program debuted in 1986. Of more interest, though, is the fact that 2013 vaulted into the number two spot for annual sales of the bullion coins with 41,547,000 logged as sold year-to-date. It passed the total sold in 2011 to attain the new position, and it’s a record pace. 2014 sales are currently on track to overtake the number one position. Last year’s sales through November were a tad lower at 41,475,000. Just 1,128,000 coins separate this year’s sales from last year’s annual record of 42,675,000 coins. In November, the U.S. Mint recorded a total of 29,600 America the Beautiful Five Ounce Silver Bullion Coins sold. Demand for the coins was aided by the temporary sales suspension of the Silver Eagles and by the November 3 release of the last five ounce coin of the year honoring Everglades National Park of Florida. Like the Silver Eagles, America the Beautiful 5 Ounce Silver Bullion Coins are not sold directly to the public by the U.S. Mint. Instead, they are sold through the Mint’s network of authorized purchasers for a small premium above the current spot price of the silver they contain. Hand in hand with silver market fluctuations, the melt value of silver coins also changes. As the market dips, the value of coins containing the precious metal falls. As the market increases, associated values move higher. The table above uses the London Fix for silver at the end of October and November to create the comparisons.